Get the latest TSP fund returns here. The Thrift Savings Plan (TSP) is a tax-deferred retirement savings and investment plan for federal employees and members of the uniformed services, including the Ready Reserve. Established by Congress in the Federal Employees’ Retirement System Act of 1986, the TSP is similar to what is offered to employees of private sector corporations in form of 401(k) plans. Federal employees who participate in the TSP can put part of their federal salary in savings for retirement, receive matching contributions from their employing federal agency, and get a reduction in their current income taxes. Use this form to start, stop, or change the amount of your contributions to the Thrift Savings Plan (TSP). Return the completed form to your personnel or benefits office. Name a person or persons to receive your account balance after your death. Civilians, uniformed service members, and beneficiary participants can use this form. Request to have an amount transferred or rolled over into the TSP from an IRA or other eligible plan. Request a transfer of Roth money from an applicable retirement plan into the Roth balance of your Thrift Savings Plan (TSP) account. For use by TSP participants who would like to make loan payments in addition to payments made through payroll deductions. Use this form to change your TSP account address if you are separated from Federal service. If you are separated, you may also request a change of address online using My Account. You will need to enter your TSP account number and your Web password to make this change. As a defined contribution plan, the retirement income a participant receives from the TSP depends on how much they (and the employee’s agency, if eligible to receive agency contributions) put into their account during the years of federal service — plus the accumulated earnings over that time. How Does the TSP Work with FERS and CSRS? If a civilian employee is covered by the Federal Employees’ Retirement System (FERS), the TSP is one part of a three-part retirement package that also includes the FERS basic annuity and Social Security. If federal employee is covered by the Civil Service Retirement System (CSRS) or are a member of the uniformed services, the TSP is a supplement to their CSRS annuity or military retired pay. How Does the Thrift Savings Plan Benefit Federal Employees? TSP participants pay very low investment and administrative expenses. According to the TSP.gov, net expenses are offset by the forfeitures of Agency Automatic (1%) contributions of FERS employees who leave Federal Service before they are vested, other forfeitures, and loan fees. Traditional TSP contributions come out of the employee’s federal pay before taxes, and the investment earnings from the TSP account are tax-deferred. Roth TSP contributions are deducted from the employee’s federal pay after taxes and the withdrawals in retirement are are tax-free. Also, earnings from Roth contributions are paid tax-free as long as certain IRS rules are met. Federal employees in the FERS system automatically receive 1% of their basic pay from your agency each pay period. The TSP participant receives the agency contributions even if the employee does not contribute on their own to their TSP account. FERS employees covered by FERS and also contribute 5% of their basic pay to the TSP each pay period, will get an additional 4% of your basic pay added to their TSP account from agency contributions. TSP participants that are age 50 or older can contribute an amount that exceeds (catch-up contributions) the annual TSP contribution limits. TSP participants have a choice of diversified investment funds and lifecycle funds. For federal employees who already have tax-deferred money in a traditional IRA or another eligible employer plan, they can transfer those accounts into their TSP account. Participants may also transfer in Roth money from an eligible employer plan. Under certain circumstances, participants may be eligible to borrow from TSP account. Under certain circumstances, TSP participants may be eligible to access their TSP savings while they are still employed by the federal government. Participants have a variety of TSP withdrawal options when you leave federal service. 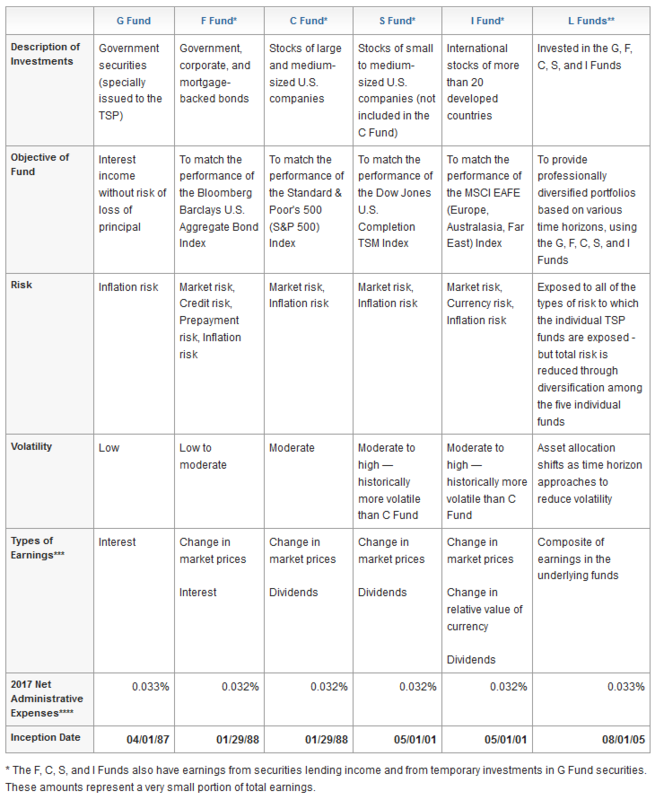 What are the TSP Fund Choices? Participants in the Thrift Savings Plan have a variety of funds to choose from, as outlined in the comparison chart below. Click here for the latest TSP fund returns. ** Each of the L Funds is invested in the individual TSP funds (G, F, C, S, and I). The proportion of your L Fund balance invested in each of the individual TSP funds depends on the L Fund you choose. *** Income from interest and dividends is included in the share price calculation. It is not paid directly to participants’ accounts. **** Net expenses are offset by the forfeitures of Agency Automatic (1%) contributions of FERS employees who leave Federal Service before they are vested, other forfeitures, and loan fees. How Do I Contact the Thrift Savings Plan?